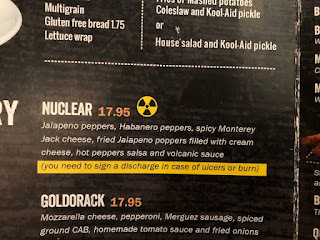 One of the burgers was called "Nuclear Burger" and under the menu, it says, "You need to sign a discharge in case of ulcers or burn," but unfortunately, they're out of the paper, which was quite disappointing to me as I was excited to see what was mentioned. 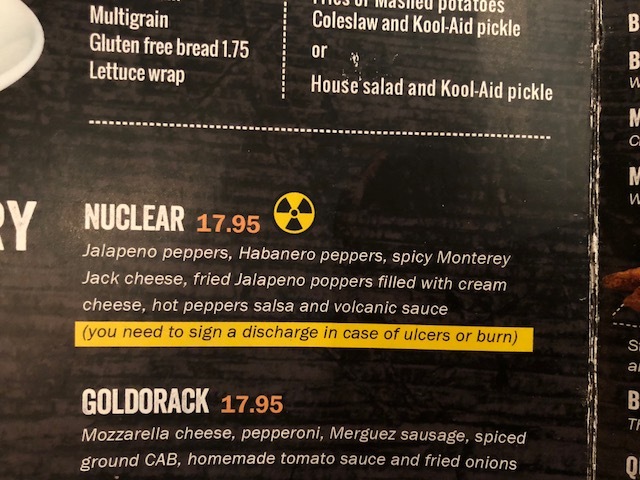 "Discharge" is something I hear at the hospitals, so I'm assuming they used the word as consent or waiver. However, when the burger was brought, the staff was wearing a gas mask and it's delightful. In place of fries, I got Poutine Classic. When it's served, it immediately spread Tabasco-like scent all over the table. 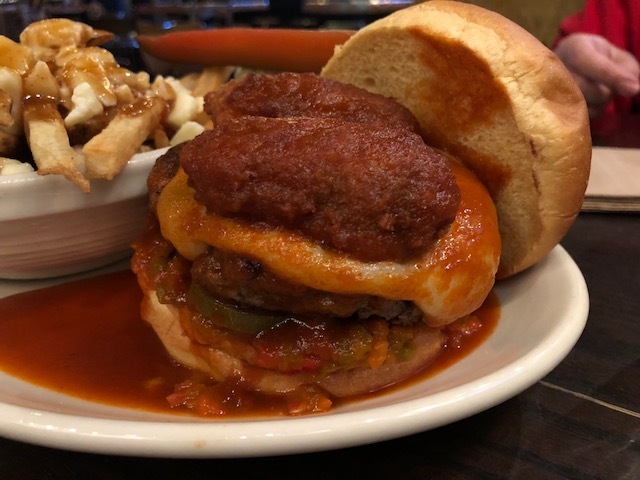 Between the buns, there're fried jalapeño peppers filled with cream cheese, spicy Monterey Jack cheese, 8oz Angus beef patty, jalapeño peppers, habanero peppers, hot peppers salsa, and the sauce was called volcanic sauce. Volcanic sauce was basically pure Tabasco, and I tried not to exhale when I was eating. 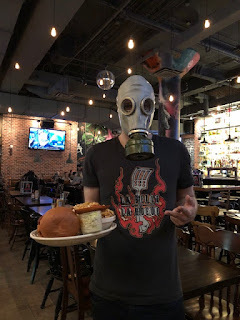 It caused me runny nose but it’s nothing close to “I’m gonna pass out” fiery-hot level at all to me, and so far in my life, the spiciest thing I've ever eaten was vindaloo curry and nothing can beat it I think. 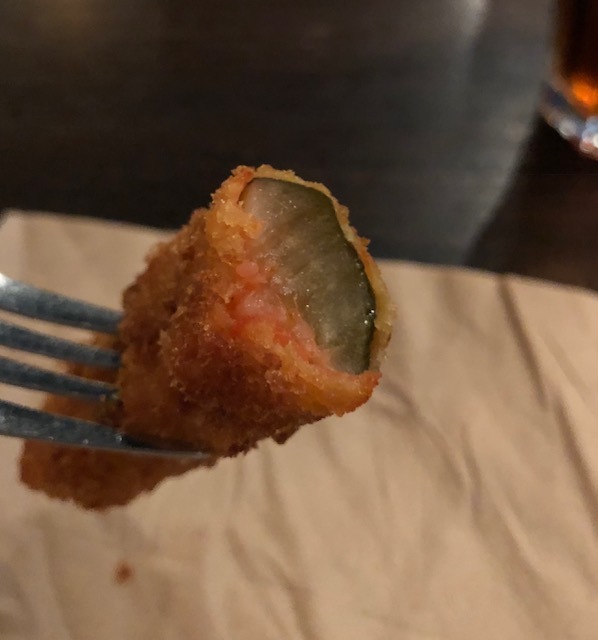 The upper bun was too thick and it’s dried like bread at school lunch or in-flight meal so that I didn’t eat most of it. 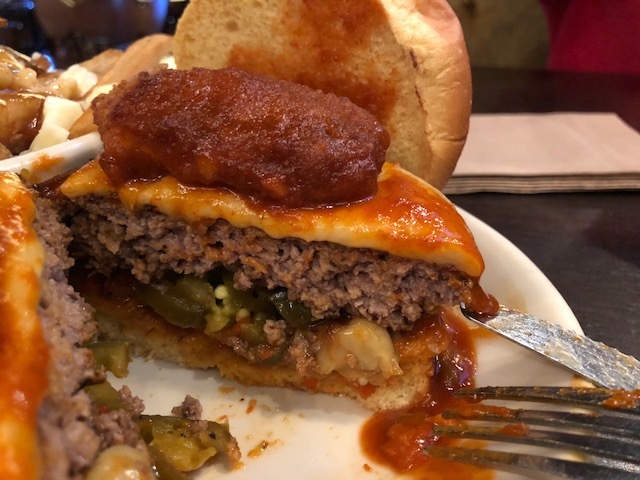 Jalapeño slices under the patty was maybe pickled and they're sour and spicy, but I know how spicy jalapeño is and I’m fine with it, so there’s no problem. 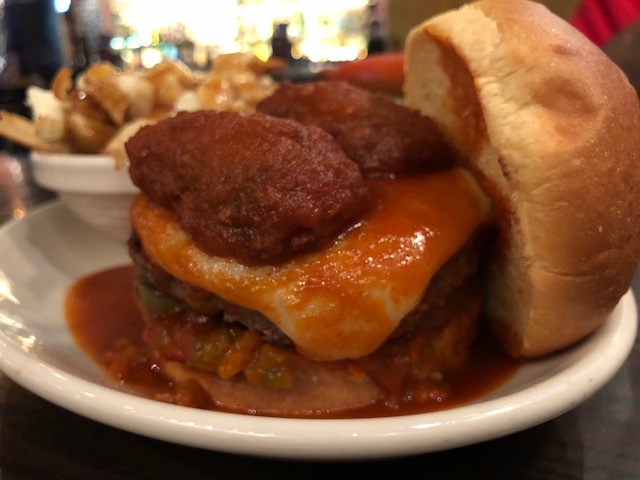 The patty was juicy and tasty, but the spicy Monterey Jack cheese didn't have any heat and it's as plain as regular cheese. 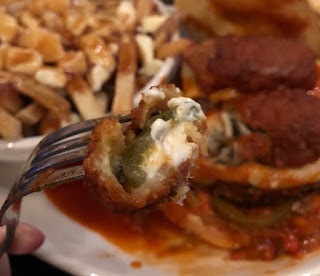 Cream cheese stuffed jalapeño poppers were somehow sweet to me as if they used mini bell peppers in place of jalapeños. Habanero was soft so that it’s either boiled or pickled, and I thought it’d be the spiciest among the ingredients in the burger, but somehow it didn’t have any heat, I tried the bell part, but no heat. 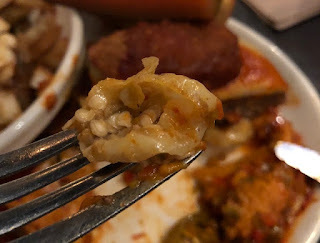 Then I tried seeds, still no heat… I don’t think my tongue and mouth were numb and just they're not spicy to me. 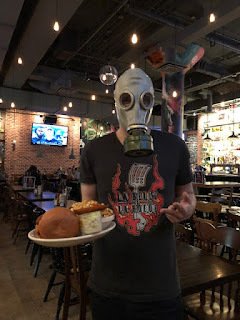 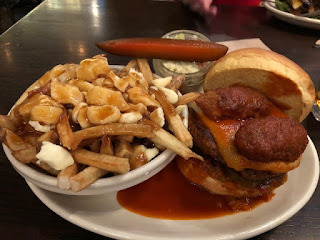 When I had vindaloo curry, it gave me some chills and goosebumps because of the spiciness, but this Nuclear Burger wasn't anything close to that and I was ok without any drinks. 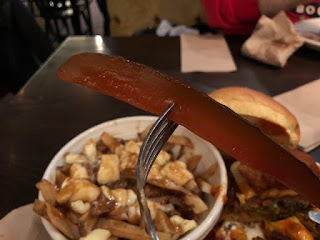 Kool-Aid pickle was red and it had the sweetness of the powder juice and sourness of pickle. 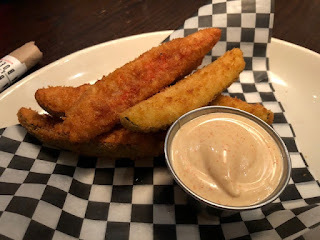 Spicy mayo sauce was served, too. 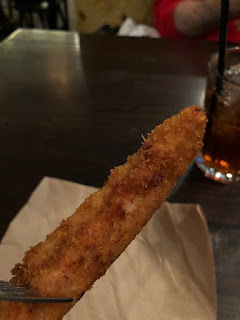 Each pickle was coated in find and crunchy panko breading, and the outside was really light and crispy. The pickle was ridiculously hot and the moisture made the hotness even more remarkable. Unlike regular fried pickles, it's cut long, not sliced, and it had Kool-Aid sugary sweetness.